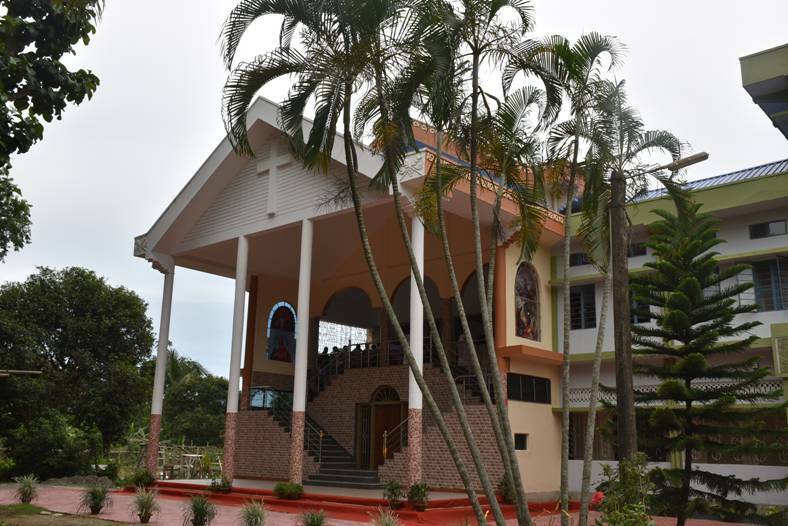 Dibrugarh, Christashram 2018: On 30 May 2018 there was the blessing and inauguration of the Chapel at Christashram Dibrugarh. It was done in a solemn Holy Eucharist presided over by Rt. Rev. Joseph Aind Sdb, Bishop of Dibrugarh. It was attended by a large number of Priests, Sisters, Catechists, Teachers, Seminarians, Pustulants, Faithful and Well Wishers. The Chapel is dedicated to the Immaculate Conception. It was a long awaited dream come true when in a very moving and devotional ceremony the newly built Chapel was blessed and inaugurated. Rev. Fr. Timothy Saldanha, the Director was congratulated and thanked for this unique achievement in the history of the Diocese of Dibrugarh. Lot of his hard work and commitment has gone into the completion of this chapel. The people who took part in the ceremony were in great appreciation and praise for the wonderful work. It was a felt need of the Diocese to have a chapel at Christashram for the catechetical and religious instructional purpose. It has taken long years of planning and tremendous efforts to bring it to completion. Bishop Joseph Aind Sdb, thanked Fr. Timothy Saldanha for the wonderful work he was able to achieve.